​ Winter Ross has been exploring the worlds of Shamanism since 2004. Her offerings include Drum Journey, Power Animals, Divination, Extraction, Soul Retrieval, Reiki and the Celtic Keening ceremony. She also offers services such as custom memorials and funerals, hand fastings and weddings, naming and croneing ceremonies. Workshops related to shamanism may be found under the "Classes" button in the menu to the left. 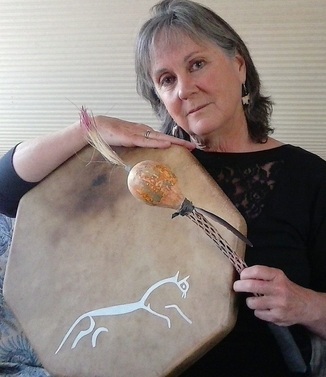 A member of the Foundation for Shamanic Studies founded by anthropologist Michael Harner, she offers the ancient healing techniques of Shamanism with an eye to her clients' 21st century western paradigm. Winter has also studied Soul Retrieval with Sandra Ingerman, Tibetan Bon Chöd (Feeding Your Demons) with Lama Tsultrim Allione, is a member of the Native American Church in Colorado and is a dancer and pipe holder in the Lakota Sundance ( Star Fire Council, New Mexico). Certified by the State of New Mexico as a mental health support worker, Winter also refers to a Colorado licensed psychotherapist. However, shamanic practice is considered spiritual work (Practice Based Evidence). For more information consult the Church of The Circle of the Sacred Earth and the Foundation for Shamanic Studies. "4 Warnings: Shamanic Journeys", written and illustrated by Winter Ross, may be found on Amazon.com and is currently used as a text in Journey classes at Awareness Institute, Sydney, Australia.